The Association of Teachers and Artists: Network of Art and Action organize the 1st School Street Festival of Art and Acceptance! 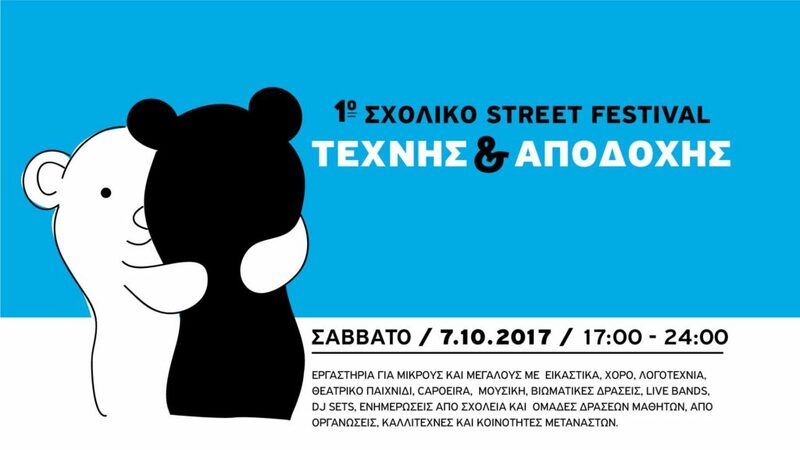 The festival will be held only for one afternoon, in the city center of Athens. The location of the event is one of the most vivid and intense multicultural areas of the Greek capital and on that day, the Greek School Community will gather along with collectives, artists, organizations, immigrant communities and refugees, representatives of social vulnerable groups etc, to discuss and request all together Acceptance and Inclusion for all the diverse members of our Society. And how are they going to do this? With workshops for kids and adults, artworks, literature, theatrical plays, capoeira, dancing, live bands and DJ sets, with outdoor exhibitions, experiential actions and discussions from schools, student groups, organizations, artists and immigrant communities! The Parade, which is going to start from Monastiraki and finish at the Festival, will be lead by QUILOMBO, Abada Capoeira and the Greek Puppet Theater Center – UNIMA HELLAS at 8 sharp! Generation 2.0 RED could not be missing out on such an event. We will be there with the floor board game Diversity Volcano! By participating in the game, children learn and recognize different cultures, countries and customs, as well as becoming more aware on human rights and discrimination issues. The schools that would like to take part in this action and present any work they have done over the past few years on the subject of Acceptance of Diversity, Inclusion, Human Rights, against Hate speech, etc., can apply by sending an e-mail at [email protected] until September 25th.